Posh star Marcus Maddison takes a bow in the company of Jack Baldwin during the 2-0 win over Charlton. Photo: Joe Dent/theposh.com. Peterborough United manager Grant McCann believes Marcus Maddison is the best player in League One on his day. Jack Baldwin of Posh fouls Charlton's Ricky Holmes. Photo: Joe Dent/theposh.com. in today’s (April 1) 2-0 win over Charlton at the ABAX Stadium. Maddison now has 15 League One assists - the most in the division - and eight goals. 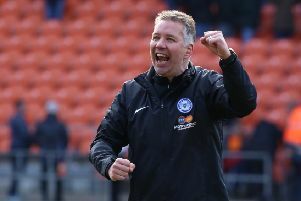 The win kept Posh in 11th place, still eight points off the play-off places with just five matches to go, but McCann was delighted with a second clean sheet in a row and back-to-back League One wins for the first time since December, as well as Maddison’s second-half display. “Marcus has scored goals like that before and created goals like he did today before,” McCann enthused. “It’s no surprise to me as he has that ability in his locker. “When he plays like that he’s one of the best players in League One, if not the best player. When he is on form, we are on form. Thumbs up from Posh boss Grant McCann after the opening goal against Charlton. Photo: Joe Dent/theposh.com. “When Marcus gets one-on-one with a defender he is very hard to stop as it’s difficult know which way he will go. “It helped him today when we made the substitutions and switched to 4-4-2. I wanted to get him and Martin Samuelsen to run off (Charlton midfielder) Andrew Crofts and it worked a treat. “It was a great goal by Marcus, a real moment of class and his cross for Martin’s goal was also magnificent. The goal will be shown time and time again on Sky Sports and so it should be. “He’s missed a few games with an injury lately, but he has the bit between his teeth now. Maddison’s scene-stealing moments took attention away from Samuelsen’s first goal of the campaign - he scored with his second touch of the ball -and from another doughty display from the Posh back four. centre-back Jack Baldwin was named sponsors’ man-of-the-match. McCann added: “I knew Charlton would play a midfield diamond. They matched us up and if we hadn’t changed system it could well have finished 0-0. “We got into some good crossing areas in the first-half, but Michael Smith and Jerome Binnom-Williams will be the first to admit they didn’t deliver the ball well. “They were both part of a back four that defended very well though. “I have to say that Jack Baldwin is a great professional. He’s had a rough time in the last two seasons with injury and he very nearly didn’t play again today. “But he should be an inspiration to the rest of the team because if he can get out onto the pitch he will. He was outstanding today and I was delighted with him and the back four. Posh travel to bottom club Coventry next Saturday (April 8) before their Easter matches against Fleetwood (home, April 14) and AFC Wimbledon (away, April 17). They finish their League One programme with a home match against Bristol Rovers on April 22 and an away game at Bolton on April 30. Binnom-Williams left the game early with a bad dose of cramp today. Paul Taylor was left out of the matchday squad because of a hamstring issue.